The SmartSkin Laser Renewal System is the latest technology to advance the science behind healing skin that is aged or has been damaged by the sun’s rays. Developed by Palomar, this new technology in treating skin that has been effected by the advancing of time is revolutionizing practices across the country. Palomar/Cynosure has built their company by committing themselves to being a leader when it comes to working with light-based technologies in order to deliver healing and medicine. They work with leading research teams and use only the highest-quality manufacturing processes in order to develop medical devices that will make a real difference in people’s lives. Their equipment is designed to work with the needs of both patients and doctors in order to lower the overhead costs of operating and address the concerns that patients take the most seriously. They are committed to helping people use science and technology to discover their hidden beauty and potential. This skin renewal laser system gives you the most control possible over cosmetic procedures of this kind, even allowing for mitigation between the treatment itself and the downtime requirements of patients. Results nearly always exceed the expectations of patients, allowing anyone to expand the client base of their practice. Patients can undergo individual treatments in as little as 20 minutes, making this system one of the most effective and efficient on the market today. 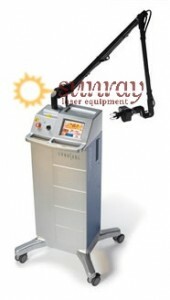 SunrayLaser.Com carries refurbished Cynosure SmartSkin units in our inventory, making it easy and affordable for you to own this item for your practice. All of our products are of the highest quality and our knowledgeable staff can answer any questions you have about expanding your practice now. All it takes is required is filling out the form below and we’ll be in touch shortly.